Learn how to make holiday bread recipes. They are very popular at several of our holidays in the United States; this is especially true for Easter, Thanksgiving and Christmas. This is also true for Easter and Christmas in many other parts of the world. Homemade breads are fun to bake and fun to give as gifts. For those who have mastered the bread machine techniques, recipes have become easier and less time consuming to make. 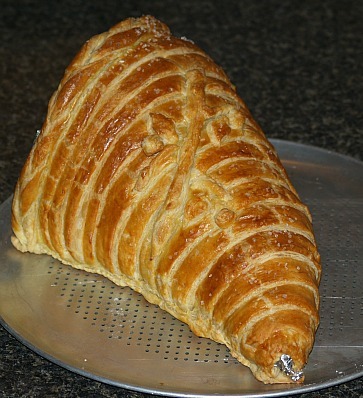 When I learned how to make holiday bread recipes one of my favorites is shaped like a cornucopia; it could also be called a pastry. You might ask how to make a cornucopia or maybe even what is one. This horn shaped container is especially associated with Thanksgiving symbolizing abundance; the reason this day was set aside for celebrating the harvest. I have made one of these cornucopia recipes for many years at Thanksgiving time as one of my holiday bread recipes. It makes a beautiful presentation on the dinner table or a buffet table. I have sprinkled it with cinnamon and sugar before baking and used it on a tray with other pastries, rolls and muffins. Other times I have sprinkled it with salt or paprika and have used it on a tray of appetizers. I also learned how to make a holiday bread recipe from an oat bread recipe and it is another favorite of mine. It is shaped like a sheaf of wheat for Thanksgiving or it can be a Christmas tree. These make a very pretty presentation on the dinner table; and it taste good too. This recipe also makes delicious dinner rolls if you don’t want to bother with the shaping; simply make balls, let them rise and then bake. 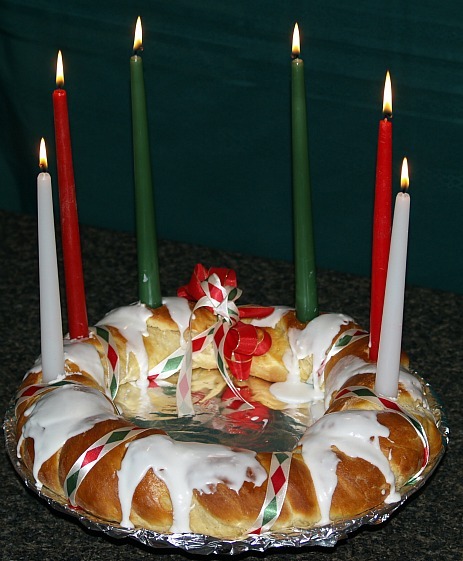 Another very good and very pretty holiday bread recipe that I like comes from Sweden. It is called St Lucia’s wreath named for St Lucia Day in Sweden; it is celebrated on December 13. As the story was told by the monks, St Lucia was a young Christian girl who secretly fed Christians who were being persecuted. This holiday bread recipe is made to celebrate the beginning of the Christmas season. In large bowl combine 2 cups flour, sugar, salt, cardamom and yeast; blend well. Add warm mixture and 3 eggs to flour mixture; blend on low speed until moistened. Beat 3 minutes on medium speed. Stir in additional 4 ¼ to 4 ½ cups flour until dough pulls away from sides of bowl. Knead in ¼ to ½ cups flour until dough is smooth and elastic. Place in greased bowl, cover loosely with plastic wrap and towel. Let rise in warm place (80 to 85F degrees0 until doubled in size about 1 ½ hours. Punch down dough several times to remove air bubbles; divide dough in half and shape into balls. Let rest on counter covered with inverted bowl for 15 minutes. Shape each half into a 45 inch rope; twist ropes together. Place in a ring shape on prepared baking sheet; pinch ends together to seal. Cover and let rise in a warm place until doubled in size about 1 hour. Combine 1 tablespoon milk and 1 egg; brush over wreath. Bake for 25 to 35 minutes until golden brown; cool on rack. To assemble cut and hollow out 6 holes in wreath for candles to fit into. Place wreath on serving tray; combine glaze ingredients. Spread a little glaze on bottom of candles and press candles in holes in wreath. Drizzle glaze over wreath and decorate. 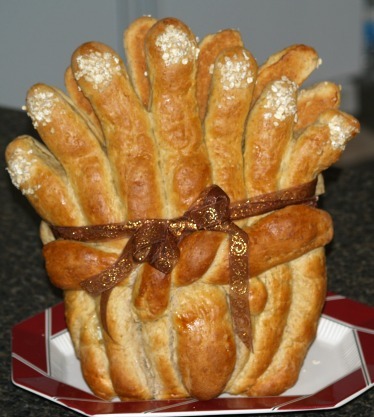 This holiday bread recipe makes a beautiful centerpiece. Grease 2 large cookie sheets. Combine 1 ½ cups all purpose flour, whole wheat flour, brown sugar , salt and yeast in a large bowl. In a medium saucepan heat water, milk and butter until very warm (120F to 130F degrees). Add warm liquid and 2 beaten eggs to flour mixture; blend on low speed until moist. Beat 3 minutes on medium speed; stir in 1 cup oats and 1 ½ to 2 cups all purpose flour until dough ball forms. Knead on floured surface in ½ to 1 cup all purpose flour until dough is smooth and elastic. Place in greased bowl, cover loosely with plastic wrap and towel; let rise in warm place until doubled. Punch down dough; divide dough in half and shape one for sheaf of wheat and one for Christmas tree. NOTE: Keep one half covered while working on other half. Sheaf of Wheat: Divide dough in 8 equal pieces. Roll 7 pieces into 12 inch ropes; place next to each other on greased cookie sheet. Roll other piece into 9 inch rope; place crosswise on top of other ropes 1/3 from top. Snip tops of 7 ropes with scissors to look like wheat; separate slightly at tops and bottoms. Brush dough with beaten egg; sprinkle snipped tops with 1 tablespoon rolled oats. Cover and let rise in warm place until doubled about 30 minutes. Bake in preheated oven at 375F degrees for 15 to 20 minutes or until golden brown. To Make Christmas Tree: With star cookie cutter, cut a star for the top from a small piece of dough. Place star near the top on greased cookie tray; divide remaining dough into 11 equal parts. Shape 10 parts into balls for tree and 1 into rectangle for the trunk. Arrange balls under the star to form the tree beginning with 1 at the top. Then arrange a row of two balls with sides just touching. Continue arranging a row of 2 balls leaving space between the two balls for 6 ounce custard cup. Then arrange a row of 5 balls (making 10 balls totally). Place rectangle piece at bottom for trunk. Grease bottom and sides of custard cup and place in reserved opening in tree. Brush dough with beaten egg and sprinkle with sesame seeds. Let rise and bake as directed for sheaf of wheat. Remove custard cup from bread; fill clean cup with flavored butter to serve. To make a mold for the cornucopia I have found it pretty easy to shape large pieces of foil into a horn shape. (Use heavy duty foil or multiply the layers to shape it). Then I loosely crumple several pieces of aluminum foil into balls and place inside the horn shape; this will hold the mold up when wrapping it in the dough. Before wrapping with dough spray outside of the mold generously with nonstick cooking spray. 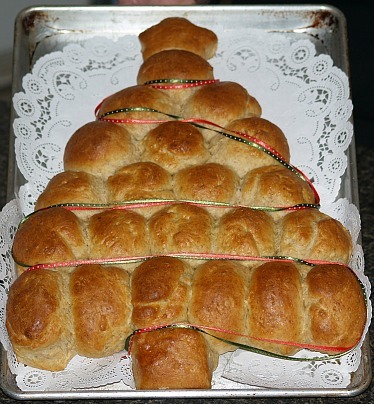 This is a great holiday bread recipe to serve with appetizers. Mix flour and salt together; cut in shortening. Beat eggs and ¼ cup water; blend in with the flour mixture until moistened. NOTE: You can add 1 to 2 tablespoons more of water if necessary. Gather into ball and divide into fourths; keep pastry wrapped until ready to use. Roll ¼ of the dough on floured surface into a triangle about 1 inch larger than the foil shape. Transfer triangle to ungreased cookie sheet to make the base; place foil mold on top of pastry. To make cornucopia roll another fourth of dough into oval about 10 X 15 inches. Cut pastry lengthwise in 1 inch wide strips; mix 1 egg with 2 teaspoons cold water. Brush short piece of dough with egg mixture. With wet side out arrange strip around tip of mold forming a point. One strip at a time brush with egg mixture and carefully cover the mold overlapping about ¼ inch. Roll third part of dough to 10 X 15 cutting in strips and continue to cover mold. Press to secure strips; make sure there are no gaps. NOTE: Do not cover large opening. Divide remaining fourth of dough into 3; roll each piece into 24 inch long rope. Make a braid with ropes, brush with egg mixture and place around large opening of cornucopia. Bake in preheated oven at 425F degrees for 10 minutes or until set. Remove from oven; REDUCE HEAT TO 350F degrees. Brush cornucopia with milk; sprinkle with sugar or a little coarse salt. Return to oven at 350F degrees for 20 to 25 minutes or until golden brown. If necessary cover large end with foil to prevent over browning. Cool completely before removing any foil. NOTE: Although this pastry recipe is easy to make and this holiday bread recipe is very good, most of the time I purchase frozen puff pastry to make it from. It is quite easy this way and I love the taste and beauty of it. This year my cornucopia holiday bread recipe will be used on an appetizer tray. I am filling it with apples made out of cheese. (Next newsletter) These are very tasty and a beautiful presentation.